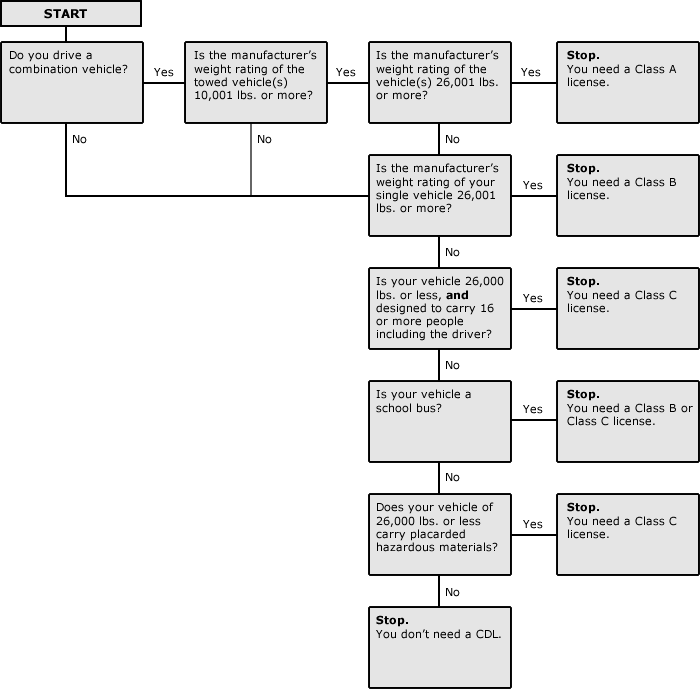 JUST RELEASED 2019 CDL TEST! 98.5% Pass The CDL Test After Using Our NEW Advanced CDL Practice Test Software! All trailers with a manufacturer's weight rating of 10,001 pounds or more, and a combined vehicles gross weight rating of 26,001 pounds or more. Infrequent drivers, such as Deisel Mechanics or Semi Truck Salespersons who will need to test drive a commercial vehicle in the above described list on a public roadway or interstate, also need a CDL and any required endorsements. Check Below if you need to take CDL Test and a CDL Practice Test. The Commercial Vehicles are generally divided into 3 classes; CDL Class A, CDL Class B, and CDL Class C. The drawing below will let you know if you will need a cdl License and need to take a CDL Practice Test, and what specific class of commercial driver license you need. A higher-class CDL allows you to drive vehicles in any of the lower classes if you have the correct CDL endorsements. The Commercial Motor Vehicle Safety Act of 1986 was signed into law on October 27, 1986. The primary intent of the Act was to improve highway safety by ensuring that truck drivers and drivers of tractor trailers and buses are qualified to drive Commercial Motor Vehicles (CMVs), and to remove drivers that are unsafe and unqualified from the highways. The Act continued to give states the right to issue CDL License, but the federal government established minimum requirements that must be met when issuing a Commercial Drivers License.